Dale Search (dalesearch.com) is browser add-on and not a virus. This adware can be downloaded and installed with your own free will. In many cases, thousands of computer users could not understand why they got this program after downloading free software. They come to realize having Dale Search due to major changes in their homepage and default search engine. Dale Toolbar also affects browsers like Internet Explorer, Google Chrome, and Mozilla Firefox. That distressing experience may serve as a lesson in installing any program mostly those that come bundled with adware. The intent is clear. It is just to deceive you in order to get Dale Search onto your system and to achieve its utmost plan; that is to gain money in your computer’s behalf. It could not be happen if you just simply take care and be more vigilant during the installation process of whatever programs you are installing. The trick there is the default tick box that you just ignore, resulting to the installation of Dale Search. 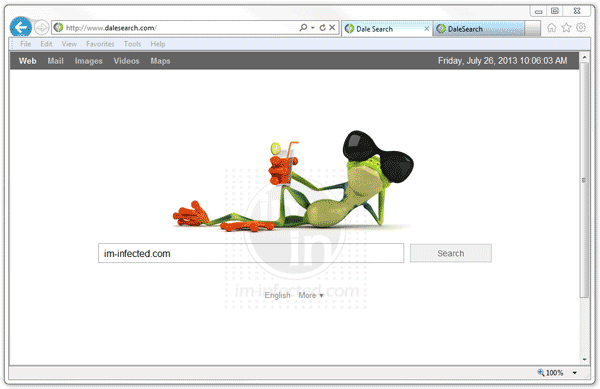 When you do any search on affected browser, you will end up at dalesearch.com. It gives you result but far more different to what you really look for. Search results also contain abundant ads, which you must not give a try to click. It is reported that unknown search engine like Dale Search is being utilized to spread malware. We highly recommend deleting this program as quickly as you can. McAfee Site Advisor is the first one who concludes that www.dalesearch.com is dangerous and contains malicious downloads. Data from statscrop.com reveals that this domain is hosted on the same IP address where claro-search.com, delta-search.com, and holasearch.com also belong. 4. It searches for presence of harmful programs, plug-ins, add-ons, or any data that were found malicious and linked to Dale Search. You need to Clean all items detected by this tool. After the previous scans, you may have deleted Dale Search from the affected browser. This next step will ensure that no more module of adware will be left on the browser. This free tool scans and checks the browser for unwanted add-on and extension, and if found, Avast Browser Cleanup will give you a report and suggestion. 4. Avast Browser Cleanup will confirm before it permanently deletes the add-on. Please click Yes to proceed with the removal of Dale Search on the affected browser.